PHOTO: Director/Actor Jon Abrahams shoots a scene in Niagara Falls State Park with Actress Mickey Sumner. (August 18th, 2015) After two weeks of principle photography the latest feature film to shoot in Western New York has wrapped. “Two For One” directed and co-written by Jon Abrahams(Meet The Parents, Scary Movie) and Michael Testone made maximum use of many area locations for a heartwarming “Dramedy” set here and in New York City. Camera Operator Shannon Madden sets up a shot outside of Groom Service in the Hotel @ Lafayette. Erika Christenson and Groom Service proprietor Katie Ambrose. Along with making his directorial debut, Abrahams also starred in this feature which saw him reuniting with childhood friend and Buffalo native Matt Quinn who served as director of photography on “Two For One”. (L-R) Annie Potts, John Abrahams, Lydia Hearst, Nicole Berger, and Martin Donovan shoot a scene outside of the Burchfield-Penney Art Center Auditorium. 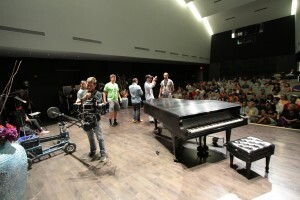 “Two For One Crew” set up for a scene on stage in the Burchfield-Penney Auditorium. 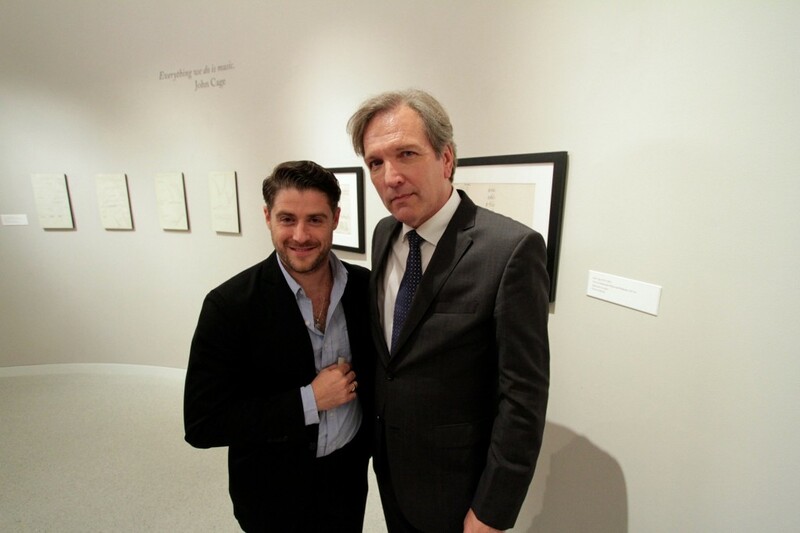 Jon Abrahams and Martin Donovan in front of the Philip Glass Exhibit at the Burchfield-Penney Art Center. “Two For One” highlighted a number of our beautiful location assets with the use of a Arlington Park residence in Allentown, Marco’s Restaurant, Niagara Falls State Park, The Hotel @ Lafayette and Groom Service, The Buffalo State College Campus,The Burchfield-Penny Art Center and many more. 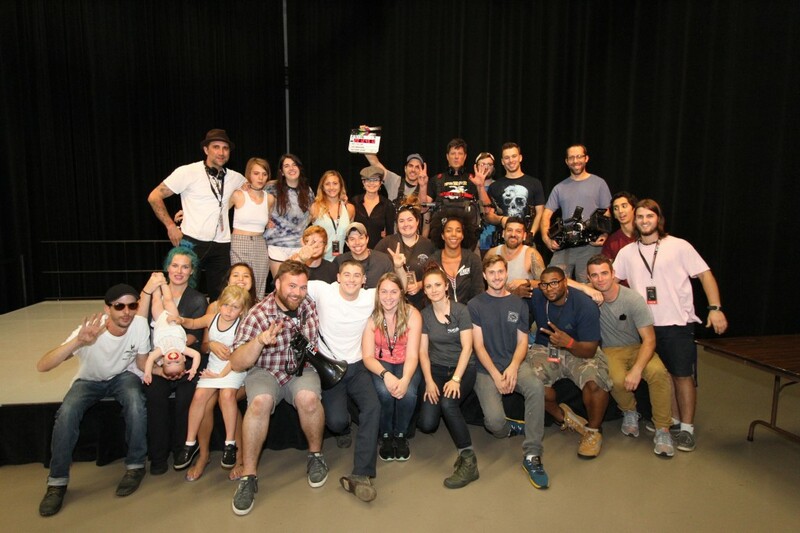 “Tow For One” cast and crew members gather for the Buffalo wrap photo. 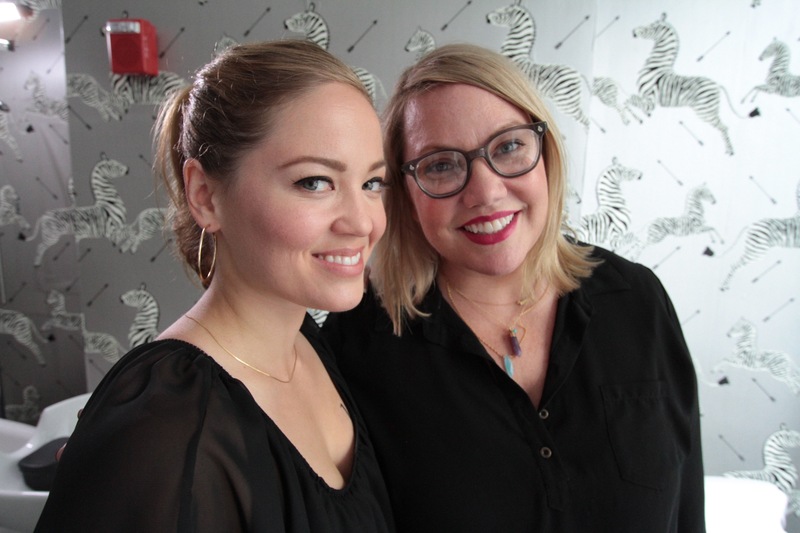 A year in the making with Bethany Hedges at the helm as Line Producer,”Two For One” realized the cooperation of multiple Buffalo based production companies including Filmkiln, ND Studios, Pan American Sound, and GCR Audio. Actress Nicole Berger on set at Groom Service. The multifaceted Jon Abraham’s brought an incredible cast with him to Buffalo (many here for the first time) with talents such as Nicole Berger, Stephen Henderson, Annie Potts, Martin Donovan, Erika Christenson, Mickey Sumner, Sasha Frovola, Lydia Hearst, and Christian George. Jon Abrahams rehearses an intimate moment on the WNED Soundstage. “Two For One” was the third feature film production this year to make use of the WNED New York State qualified sound-stage on it’s final day in Buffalo. 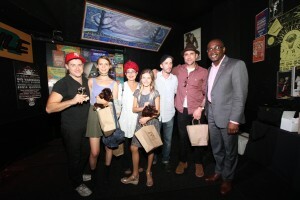 Wrap party presentation at DBGB’s with (L-R) Jon Abrahams, Sasha Frovola, Annie Potts, Nicole Berger, Matt Quinn, Michael Testone, and Buffalo Mayor Byron Brown. The day ended with a wrap party at DBGB’s on Allen which featured a special visit from Mayor Byron Brown. “Two For One” will head to post production in Buffalo after a quick 2 day shoot in Los Angeles.